As this name suggests, the Trias of Germany had long been known (since the mid-eighteenth century) to consist of a sequence of three distinctive series of rocks. From oldest to youngest, they are the Bunter Sandstone, the Muschelkalk Limestone and the Keuper Marls and Clays. Of these, only the Muschelkalk was a marine deposit, the older and younger strata were predominantly non-marine successions, which created great problems in determining their relative age and position in the overall succession. Their various fossils were well described and illustrated in the 1820s. But there was still considerable confusion and mismatching of strata, especially between the Muschelkalk and Zechstein limestones. By 1834, German geologist Friedrich August von Alberti felt confident enough to group them together as an identifiable system. Alberti proclaimed that whoever tabulates all the fossils of the three hitherto separate formations; whoever examines, further, the transition of the different forms one into the other, and, indeed, considers the entire structure of the mountains and the markedly different character of the fossils of the Zechstein from those of the Lias, will realise that the Bunter sandstone, Muschelkalk and Keuper are the result of a single period, their fossils, to use Elie de Beaumont's words, being the thermometer of a geological period; that their separation into three formations is not appropriate, and that it is more in accord with the concept of a formation to unify them into a single formation, which I shall provisionally name Trias. Friedrich August von Alberti, 1795-1878, German mining geologist, inspector and finally manager of the Friedrichsall Saltworks, who described in detail the Bunter, Muschelkalk and Keuper strata and first suggested their union as the Triassic System in 1834. Again, there was a problem of correlation, in that most of the European Triassic strata were continental rather than marine deposits. What did marine Triassic deposits look like and what were their fossils like? Fortunately, they did not have to look too far away, just as far as the Alps. But the tectonic complications of extreme folding and faulting of the strata presented new problems that took a considerable time to unravel. Sedgwick and Murchison had together made a foray into Alpine geology in 1830. Thanks to Sedgwick's skills in unravelling the geometry of complicated fold structures, they had published some remarkably accurate cross-sections of the folded strata. Jean Baptiste Elie de Beaumount, 1798-1874, French geologist and professor at the College de France who compiled a geological map of France (1841) with Dufrenoy. He also demonstrated that different mountain belts have different ages. Count Georg Graf zu Münster, 1776-1844, Bavarian aristocrat and fossil collector who held office as Bavarian court chamberlain and whose large collection of fossils formed the basis of the state museum in Munich. collected many of the fossils and sent them to Count Georg Graf zu Münster for identification. In 1841, Münster published a description of 422 species from the St Cassian strata, including molluscs, brachiopods, echinoderms, corals and sponges, all creatures that lived in warm shallow seas. Of these species, Münster recognised some that he thought typical of Carboniferous strata, some from the Zechstein, others from the Muschelkalk and finally some Jurassic ones as well. In detail, most of these marine animals were not very widespread in their distribution, but were relatively long lived as genera and species so were not very useful for diagnosing the relative age of the strata. However, it was soon realised that the Cassian strata lay above the Alpine equivalents of the Muschelkalk and that the Hallstatt marble of the northern Alps was of similar age, since it contained similar fossils. In addition, it became clear that these fossil-rich strata were distinct from the younger Liassic limestones. Identification of the fossils, such as this small lampshell (brachiopod) with its coiled internal spiralia, from the St Cassian strata in the Tyrolean Alps of Europe helped match terrestrial and marine rocks of Triassic age from northern and southern Europe. complexities. Matching the strata across the Alps and beyond was even more difficult. We can now understand why and have to admire the efforts of those European geologists who struggled over several decades to make sense of it all. The strata of the Alps represent the deposits of an ancient ocean, called Tethys, which were hugely compressed, folded and faulted, with some of the deeply buried rocks being highly metamorphosed. The extensive foreshortening, driven by the northward movement of Africa, destroyed most of the evidence that would normally have linked the offshore marine and onshore continental deposits. By the mid-1850s, the young German palaeontologist Albert Oppel had realised that an extinct group of coiled cephalopods (distantly related to the living cuttlefish and squid), called ammonoids, were particularly useful for matching strata. Often abundant in limestones, shales and marls, experts can distinguish the separate species of these sea-dwelling creatures by detailed examination of the fossil shells. These 'shellfish' were free-swimming molluscs with a buoyant shell that lived at different depths in the water column. They evolved rapidly and many were widely distributed in the seas and oceans of the world. Individual species tend to be confined to relatively small thicknesses of strata, and yet at any one level the same species are found over large regions, so they are ideal for matching strata that were originally laid down on the seabed at the same time. They could still be matched even when the contemporary sediments that enclosed the fossils were different. Since one particular fossil ammonoid species occurred in a limestone in one place and in a shale somewhere else, it meant that the limestone and shale had been originally deposited at more or less the same time and therefore could be linked with one another in terms of the overall succession of strata. Albert Oppel, 1831-65, German professor of palaeontology (from i860) and director of the palaeontological collections (from 1861) in Munich and travelled through Europe to compare Jurassic strata. He showed that successive changes in ammonite fossils could be used to distinguish stratigraphie succession in detail. Oppel pioneered this use of cephalopods for correlation in both Triassic and Jurassic strata. Subsequently, it was found that other kinds of fossils could be used in a similar way for correlation of different parts of the geological column. For instance, graptolites proved equally useful for matching lower Palaeozoic strata. 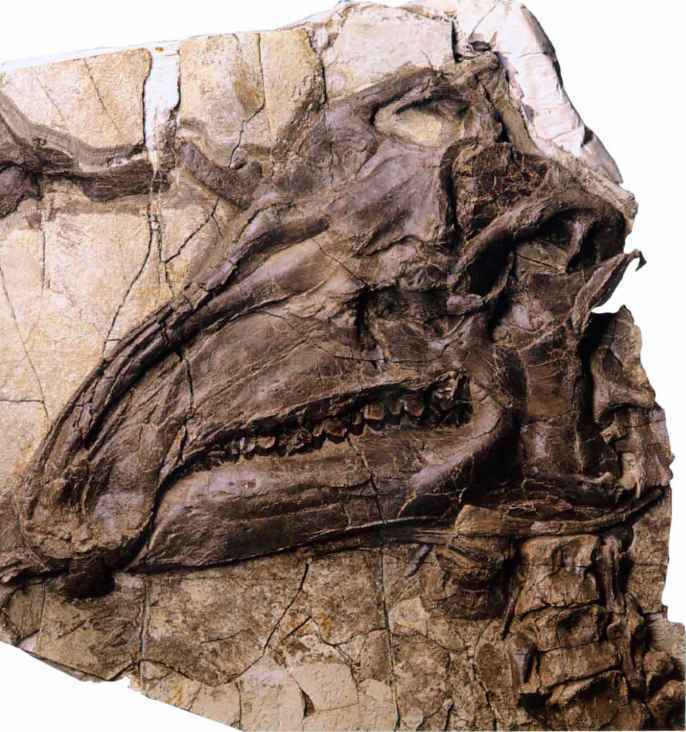 Oppel's work strengthened the whole approach to the subdivision of Earth Time through the use of characteristic fossils. In London some Fellows of the Geological Society complained that the whole business of the Society and the pursuit of geology in general was being taken over by 'fossil men'. Oppel also found the first fossil 'keys' to the problem of matching Alpine deposits of upper Triassic age with their age equivalents elsewhere. Not one of the 1000 or so species known from the St Cassian and Hallstatt beds by this time could be found in regions beyond the Alps. But Oppel found the same fossils in the highest and youngest Triassic strata of both the Alps and Swabia. They occurred in strata that seemed to pass from the top of the Trias into the Lias above and they were subsequently called the Rhaetic Group of strata. However, experts on different groups of fossils could not decide whether they would be better placed at the top of the Trias or at the base of the Lias in the Jurassic System. After more than a century of wrangling, the Rhaetic is now placed at the top of the upper Triassic. Johann August Georg Edmund Mojsisovics von Mojsvar, 1839-1907, Austro-Hungarian turned from study of law to geology with Edouard Suess, joined the Austrian Geological Survey. He made a particular study of the Mesozoic strata and fossil cephalopods of the Austrian Alps. Siberia, and they were subsequently found in both Transylvania and California. Most importantly, these correlations showed that the Alpine region had not been an isolated one as had been thought and that Alberti's Triassic System had an international significance. We now know that from around 200 million years ago, at the end of Triassic times when the North Atlantic began to open, a succession of plate fragments rifted away from the northern margin of the African plate. During early Jurassic times they moved north, closing Tethys, and collided with the southern margin of Eurasia. The resulting compressive movement crumpled and thickened the mass of Tethyan sediments. Some were pushed down, heated and metamorphosed, while the top of the fold pile was elevated to form the high mountain belt of the Alps and Carpathians. Similar movements pushed the Spanish Peninsula towards France and crumpled up the Pyrenean alpine chain. During middle and late Tertiary times, Africa continued to move north and has done so ever since. Movements along major fault dislocations in Iran, Turkey and the Aegean region are a continuing expression of this movement. Much of the complex and large-scale overfolding seen in the Alps results from mid-Tertiary movements (around 15 million years ago). Similar processes continue today in the Mediterranean region, generating the numerous earthquakes and the remaining vulcanism of southern Italy. But the Alps are only part of a much larger fold belt that extends eastwards and connects with the Himalayan belt, where the intense folding was and still is the result of India driving northwards into the southern flank of Asia.